Lay Lake. Another Coosa River recreational lake, but not quite as bad as upriver Logan Martin Lake. 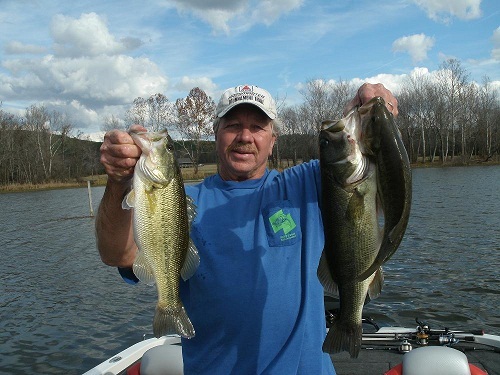 Lay Lake can still produce quality bass during the scorching days of summer. 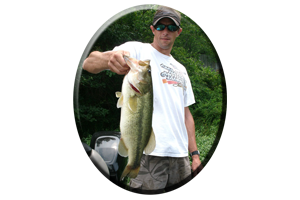 Bass tournaments are held here every week throughout the summer including some weekly night tournaments. Yet with so much fishing pressure the bass factory still produces winning bags featuring 5 bass weighing over 20 pounds on a regular basis. How? Simple, the weeds. Any lake that has an abundance of weeds like Lay Lake, that is kept at or near full pool year-round, can consistently produce some decent size bass. 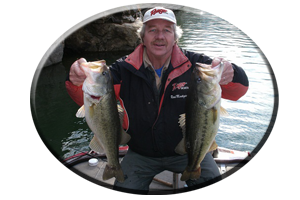 That, plus catch and release is what makes Lay Lake so good for summer fishing. Many bass are now released right back where they were caught, for the next angler to fool and release again. Upon inspection, hook marks are common on these lure-conditioned bass, where the mouth has not even had time to heal from the last hook-up. During the summer days when temperatures hover in the 90′s bass will bury up in the weeds. Early in the morning or during a cloudy, rainy day these big bass will roam the shallows or come out to the weed edges among all of the feeder creeks and small pockets lined with weeds lake wide. This is when frogs, rats, weed less spoons, buzzbaits, worms, spinnerbaits, floating worms, lizards, soft plastic jerkbaits and many other weed less lures, will fool some of Lay Lakes age old lunkers. This takes place from one end of this 50 mile long lake to the other, for weeds are everywhere. But weeds are distracting to the shallow water angler and take away from other bass hideouts. Just behind the boat of a bank-beating angler are stump rows, standing timber, ledges, drop-offs, humps, roadbeds and main-lake points, all loaded with schools of bass that relate to river structure and washed-in debris rather than weed-lined banks. Deep-diving crankbaits, Carolina rigs, Texas rigs, jigs, jigging spoons, rattletraps and spinnerbaits will all take these deep water bass. Some knowledge of the lake and map study will be needed to eliminate a lot of fishless water. Like Logan Martin Lake, Lay Lake has a river-type upper section. Current and baitfish whereabouts play a huge roll during the summer in these lake headwaters. Check water generation schedules before going fishing by calling 1-800-lakes-11. On Lay Lake the night fishing is just as popular as the day fishing. 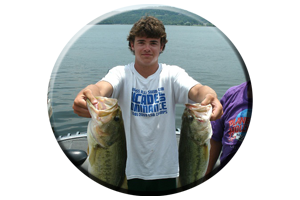 Several marinas hold weekly night tournaments and some big bags of bass are brought in during these 4-8 hour tournaments. One marina, Paradise Point Marina, site of the Bassmasters Classic, is situated at mid lake and they have night tournaments. Call (205) 669-1515 for more info. Like during the day, most nighttime anglers concentrate their fishing around the weed-lined banks. 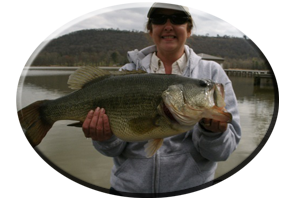 But the knowledgeable anglers can find bass around lighted piers, boat docks, marinas, causeways, and on creek flats. Some anglers cast, flip or pitch their lures around man-made structures at night, while others cast small finesse worms, grubs and jigs around well-lit piers and boathouses. Fishing weedy areas around marinas will produce bass that have been released during the many tournaments held each week. Back-lit spots like these are also good for fishing weed less topwaters, as bass are always looking up for an easy meal. * Darker model lures are suggested for after dark fishing. 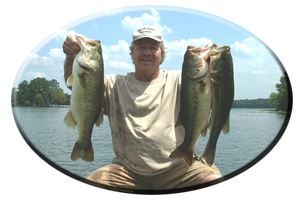 Lure action, noise, flash and adding fish attractants, all aid an angler in enticing bass. Bass that must first find the lure, before even striking. Slow retrieves, sharp hooks and paying close attention on every cast, will help avoid missed strikes. Some bites are merely a gentle slurp, but can be a bass over 5 pounds, slowly engulfing your lure. Lay Lake has many feeder creeks, some stretching for miles far back in the woods. Within all of these tributaries are creek flats loaded with stumps, logs, brush, rocks and other cover. If you can brave the dark, these hidden spots have some big bass that roam the shallows, usually unmolested at night. Waxahatchee Creek on the lakes lower end, is an all night excursion, fishing in this huge feeder creek. An old standby topwater lure, the jitterbug, is an excellent lure for slow retrieves and finding the big bass on these creek flats. Broke-back models, with rattles, in the color of black are best. Clear water and a little moon light are the complete recipe for some explosive bites in these Lay lake backwaters. Boat running lights are a must and its the law to keep em’ burning at night. All of these nighttime bassin’ tactics are good throughout the summer on Lay Lake.